This thread is simple! Rather than having a million little threads about everything that goes on at Michigan's Adventure, this thread is designed to consolidate it all into one user-friendly thread. Feel free to use it to post updates, trip reports, questions, comments, and of course, general discussion. For pictures and videos of the park as well as past updates, see TPR's Park Index Michigan's Adventure . Michigan's Adventure amusement park will celebrate its golden anniversary next summer with the largest investment in a new ride in the amusement park's 50-year history. Construction is already under way on the $5 million-plus Grand Rapids -- a 1,500-foot-long rapid river ride similar to Thunder Canyon at Ohio's famed Cedar Point park. Riders will be in nine-person rafts that navigate twists and turns of a roaring man-made river in the two-minute ride. The ride will be called "Grand Rapids," invoking a logging-era theme and named for the region's largest city. It will become a signature ride in the park right along with the Shivering Timbers wooden roller coaster, General Manager Camille Jourden-Mark said. In addition to the water ride, Michigan's Adventure will be adding a 3,000-square-foot sit-down restaurant called Coasters. The classic 1950s-style diner with 80 indoor seats will be located just inside the park's main gate across from the Corkscrew coaster will serve hamburgers, cheeseburgers, fries and shakes in air-conditioned comfort. "We are extremely excited about the addition of the Grand Rapids (ride) and believe it is the perfect centerpiece for our golden anniversary celebration," Jourden-Mark said. "Our guests will love it. They will get drenched." The ride's name is in recognition of the city of Grand Rapids, which plays a key role in the Michigan's Adventure market, Jourden-Mark said. The park is attempting to put a Michigan theme on many of its attractions, she said. "We hopefully will get some attention from Grand Rapids, which is the most important city for our market," Jourden-Mark said. "It's a fun name and has some great T-shirt potential." Riders -- who must at least be 42 inches tall instead of the traditional 48-inches on similar rides -- will be sent down the river on rafts that will go over churning rapids and under waterfalls. The new river rapids ride is not as extreme as some, being designed for smaller riders to accommodate the family nature of Michigan's Adventure, Jourden-Mark said. The Grand Rapids ride will be located near Adventure Falls water ride to the east along Wolverine Lake. The ride, designed by IntaRide LLC of Glen Bernie, Md. and Glynn Geotechnical Engineering of Lockport, N.Y., will nearly complete development around Wolverine Lake. The $1.25 million restaurant development will be the first sit-down, indoor restaurant in the park located on the Fruitland and Dalton township line on Whitehall Road between Muskegon and Whitehall. Since Michigan's Adventure was purchased by Cedar Fair LP -- the owners of Cedar Point and six other amusement parks across the country -- the publicly traded company has invested $18 million locally in capital improvements. Major rides have included an extreme swing ride Rip Cord and last year's hit the Funnel of Fear, a giant funnel ride in the park's WildWater Adventure Waterpark. Neither Grand Rapids nor Coasters is directly related to a recently completed deal between Muskegon County and Cedar Fair to bring municipal water to the park, Jourden-Mark indicated. The water service deal has county officials hoping that future expansions will include a recreational vehicle park and campground and year-round hotel with indoor water park, but neither of those developments are in the 2006 plan. "We are ecstatic to learn of the continued large investments at Michigan's Adventure," said Sam Wendling, director of the Muskegon County Convention &amp; Visitors Bureau. "We know this is one of Cedar Fair's best performing parks. "As a community, we are glad to be apart of their success. We look forward to their 50th celebration this summer." Michigan's Adventure traces its history back to the spring 1956 when a group of St. Joseph businessmen developed Deer Park, a petting zoo for families. L.R. Beardsley, Dr. E.S. Gillam, Hardin Dey and Martin Kasichke formed Deer Park Inc. It opened in May 1956. The St. Joseph investors eventually sold out to Benny Bensinger of Muskegon, who added some simple amusement park rides to Deer Park. Bensinger sold to Roger Jourden in 1968. It was Jourden and his family who took the quiet petting zoo and created the largest amusement park in the state of Michigan. Jourden created two parks -- a traditional amusement park with "iron rides" and a water park -- for a single admission price. It was renamed Michigan's Adventure in the late 1980s and he eventually sold the park to Cedar Fair in 2001. Jourden-Mark began working in the park as a young girl, helping her parents operate the growing business. She remained with Cedar Fair after the park's sale and has become a vice president for the new owners. "This will be a very fun summer at Michigan's Adventure," Jourden-Mark said. "We are excited to show our appreciation for 50 years of patronage and support." Michigan's Adventure had a peak of about 480,000 visitors in 2003 and was down a bit in 2004. However, all reports are that the park had a record year in attendance this past summer with its warm, dry weather. Exact attendance figures won't be released by Cedar Fair until the end of the year. Michigan's Adventure has held the line on admission prices to $23 since 2002. However, general admission will increase by $1 next year to $24. Season passes -- which is good for Michigan's Adventure and all Cedar Fair parks -- will be offered at a special fall rate of $85 through the end of October. Michigan's Adventure will open May 20 for the 2006 season. Great additions IMO, Coasters especially, somethign they sorely need. After getting the water agreement this year I think they will really start working on the place. They really need to market it too vacationers to the "Midwest Riviera" that is the West Coast of Michigan. Good to see my homepark get some love. Last edited by robbalvey on Fri Jun 06, 2014 3:30 pm. I'm kinna excited about them building the rapids ride. They are really interesting rides, and you dont see them getting built a lot anymore, so this is kind of exciting. Maybe it will include some of those whirpool effects that Intamin offers as an option, I've never seen them in person but they look really cool from the pictures I've seen. I think that it would be a good ideaif some of the just stand-alone water parks would build these rides, as I think they would fit in nicely at a stand alone water park. I can't wait to see some conception art or something along those lines. Of course, then again it is Michigan's Adventure so we won't see anything until the park opens for the year. I have to say while I really wasn't expecting anything at all, I am still disappointed. I had no idea it was the 50th anniversary of the place until now, but I would think that they would install a great coaster for the occasion. A nice B&M Floorless or whatever, just a good coaster. Oh well, I won't get to the park for years to come anyway, unless they add a new coaster that would be worth the drive. ^yes because a park that size really needs a B and M floorless. They got what they needed more then anything, and that is a real restaurant. I can really see them turning the park into a mini Dorney, in fact I really hope that is what happens. Such an original name for such an original coaster. We all knew this one was coming. Surprised they haven't had pieces started arriving at the park yet. 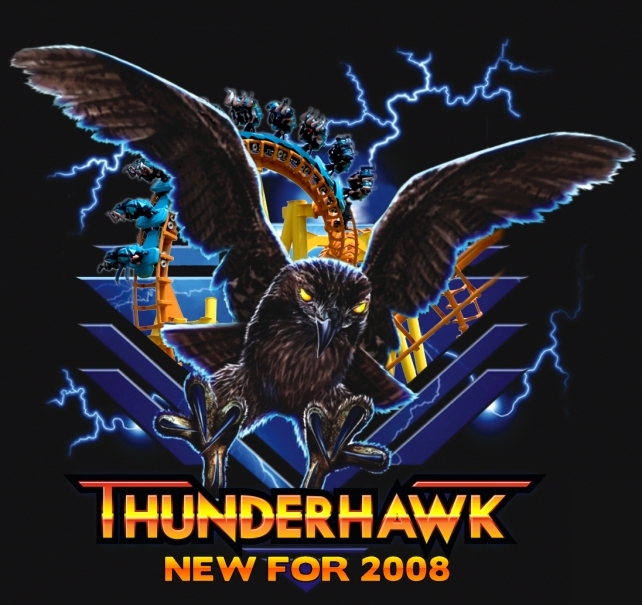 Looks like cedar fair was too lazy to re-name it. A knight who says NI! Maybe lazy, but by keeping the name they can use all the old signage and stuff like that if they want to save money, although are those new track colours? I can't believe they didn't re-name it. I hope Dominator gets a new name and new paint at it's new home.